I was so excited to finally see Etihad’s A380 apartments that I actually left the lounge well before boarding just so I could wander around the gate area, looking at all of the Etihad signage. Somewhere in the back of my mind though there was a small doubt. I have had aircraft switched on me at the last minute before. If we were downgraded to any other plane in the Etihad fleet I would be inconsolable. Despite the fact that everything pointed quite strongly to the fact that I was about to step aboard the A380 and finally see Etihad’s Apartments for myself, I needed to actually see that massive whale jet in the flesh in order to really let myself get swept up in the excitement. On the one hand the screen said The Residence… on the other, it said First Class rather than Apartments. As I approached the window I finally caught a glimpse of our enormous plane set against a beautiful pastel sunset. No turning back now, I was about to fly Apartments for sure! At this point I might have pumped my fist a couple of times and started pacing around frantically ?. If I bumped into you during my moments of jubilance, I apologise. It seemed like an eternity until boarding was called but when the moment finally came, we were at the front of the line and ready to have the cabin to ourselves for a fleeting few seconds before everybody else boarded. As we stepped off the jet bridge and onto the plane, we were greeted by a beaming row of cabin crew, one of whom offered to guide Kamara and I to our suites. The lower ceiling and narrower fuselage upstairs really makes the space seem so much more intimate than the cavernous downstairs suites cabin on the Singapore Airlines A380. The sense of privacy when looking around the Etihad cabin is remarkable. This shot is taken from row 1, looking back towards the curtain through which we first entered. You’ll notice that whilst all the walls are quite high, there is one on the right which is a bit higher. This is the wall that separates The Residence from the rest of the cabin. Another advantage of the suites with seats by the window: even looking in with the doors open, you wouldn’t be able to see the person sat in the seat, thanks to the privacy afforded by the vanity cabinet. On Singapore Airlines you can easily see into numerous other suites when the doors are open. 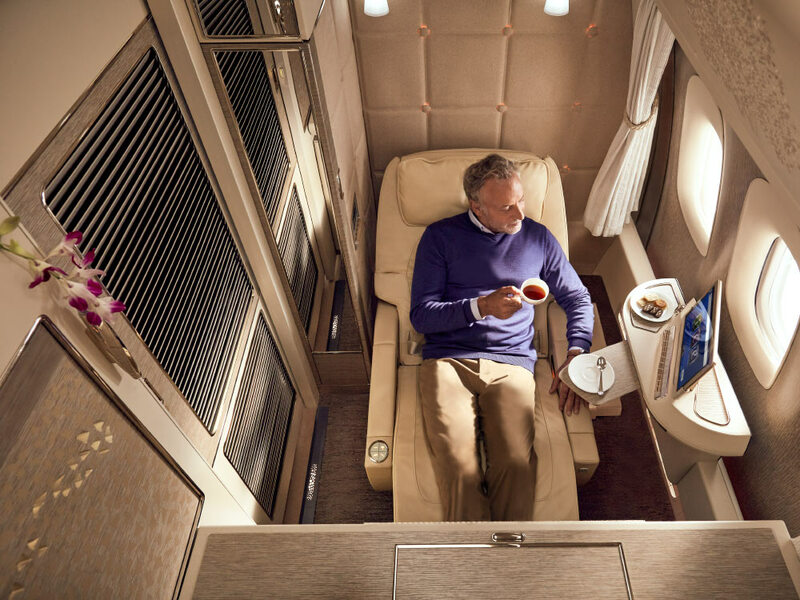 On Etihad, even with every door open and the partition down between connecting suites, you’ll struggle to catch sight of anybody, unless you get up from your seat. The recessed lamp with a touch button that gives you a choice of multiple brightness levels. By far the most elaborate lighting I’ve ever seen on a plane. Looks more like a hotel than an aircraft. Default Jarvis behaviour when first boarding a plane: camera in hand. As you can see, the different brightness settings on the lamps are quite noticeable. Beneath each lamp is a storage space for your noise cancelling headphones. We were each given a large Etihad carrier bag with ribbon handles, much like what you’d receive when shopping at an expensive boutique or department store. The bag contained our slippers and pyjamas, which I’ll discuss later. Seeing that I had finished taking my first round of photos, Roberto the FA from earlier, returned to offer us pre-departure beverages. I asked for champagne and was asked if I would also like Arabic coffee to go alongside it. I’ve grown to quite like Arabic coffee and look forward to this small ritual whenever I fly a middle Eastern Airline in F or stay in a Middle Eastern luxury hotel. Moments later, Roberto returned with a beautifully presented tray for each of us. The tray held the champagne, a cold towel, some dates, Arabic coffee and a welcome note from the Cabin Manager. I’ve seen one or another of these items on flights before but the overall effect of being presented this ‘welcome tray’ is really fantastic. NOTE: At the time of this flight Etihad served Bollinger La Grande Année 2005 although this has now been significantly downgraded to Billecart Salmon 2007. Etihad Apartments pre-departure welcome tray. That picture definitely shows the width of the apartment but still doesn’t really capture the overall scale of the gargantuan space in three dimensions. Clearly, it was time to reach for the GoPro. The full, awesome scale of Etihad’s apartments. At this point you may have noticed that there are seatbelt clasps spaced along the bench – the same bench which goes on to become a bed later in the flight. In fact there are three of them, meaning that each SINGLE apartment has a seating capacity of four people (if you put the divider down between two apartments as we did, making a double apartment, there is space for EIGHT people!). It is worth noting though that officially Etihad prohibits you from receiving visitors from the Economy and Business Class cabins though, so it is highly unlikely that you’ll actually fill all of these spaces at once! Moments after finishing my first glass of champagne Roberto approached and offered me another. Suitably fuelled, I got to work taking more detail pics. Etihad Apartments – under bench storage. My feather filled mattress topper occupied part of the under bench storage. Unfortunately there is a bit of a design flaw here. My standard sized Rimowa carry-on fit under the bench but the flap wouldn’t close. This meant that the flap became a constant trip hazard both for me and any FAs coming in and out of my Apartment. The seat and bench are upholstered by Poltrona Frau and feel very luxurious indeed, whilst still featuring a hard wearing grain. On my left, as I sat in my seat I had numerous regular control buttons to control seat functions. Lifting up the armrest I was able to access a storage compartment and a far more detailed selection of controls for the various facets of my apartment. The dining table was located inside the right hand armrest. The mirrored and illuminated vanity cabinet is undoubtedly one of the most impressive features of the apartments. A lot of hotel suites I’ve stayed in don’t have an area this elaborate to get ready in. The amenity kits were unbranded but very well made, in a traditional Arabic design. The amenity kits were given to us empty with all of the various creams, combs, razors and sleep masks supplied in the pockets inside the cabinet. Beneath the vanity cabinet is a giant drawer containing the rest of the bedding. Universal power socket beneath the cabinet (tilted sideways so that there are no issues plugging in iMac chargers – unlike CX business class). Along from the bedding is another chilled minibar drawer. I actually found this quite useful during the night when I awoke to a mouth which was dryer than Gandhi’s sandals – on account of the copious amounts of alcohol I had consumed during dinner. Above the minibar is another large, leather lined drawer. It may seem weird to focus on it but this drawer is the perfect example of how every little detail has been thought of in the design of the Apartments. It has a soft closing mechanism, which not only feels satisfying but also reduces noise in the cabin. The fact that it is leather lined adds a luxurious feel and also stops items from slipping around. The drawer is easily accessible from both the seat and when lying in bed. It contains a light which switches on when the drawer is opened, meaning that you don’t have to go turning on lights when looking for items at night. I really like it when a First Class seat comes with its own wardrobe. I much prefer this to handing over my jacket where it could possibly get damaged or stained by the crew. The Apartment wardrobe is big enough to fit a large winter coat or a jacket, shirt and trousers. Given how private the space is this means that you can get changed and store your clothes all without leaving your own private space. A pair of push out storage compartments. If you press the lightbulb, a reading light pops out. The IFE was one of the latest generation models featuring a slick touch screen, similar to those on the refurbished SQ 777s and the latest generation of QR planes. Also, finally! A plane with an HDMI connector rather than the usual S-video or RCA inputs. Nice to see an airline finally entering the 21st century. The final connector on the right is a magnetic connector for the noise cancelling headphones. This means that a sharp tug doesn’t damage the headphones and it also makes it easy to quickly disconnect them and plug them into the connector by the bed. Menus were distributed whilst we were still on the ground. The menus aren’t presented in leather covers as you see on some other airlines but are instead printed on very high quality paper and are impressively sized. Just a small detail but getting a basic little menu booklet does detract somewhat from a First Class experience (I’m looking at you, BA). Etihad make a big deal out of the inflight chef in First class – and so they should. We were first introduced to the chef pre-takeoff and he explained to us in detail that he was able to mix and match any items that we wanted and was also happy to cook meat to our preferred degree of doneness. This is something I’ve yet to experience on another airline. He also suggested wine pairings to go with our main courses and offered to hold aside any items we might like for breakfast too. Shortly after our characteristically quiet ascent into the night sky, the crew came round to take our pre-dinner drink orders. We take it in turns to be ‘buddy’ when dining together on planes. This time it was my turn to head to over to Kamara’s seat (You can see the bedside headphone sockets I mentioned earlier, as well as a second set of lighting controls on the dividing wall). The presentation of the dining experience on Etihad Apartments is absolutely spectacular. I was completely blown away by the entire setup: Perfectly pressed linen tablecloth, full sized designer cutlery, individual oils and butter, massive folded napkins and a varied selection of stemware. Table for two on Etihad Apartments. I spotted one of my favourite cocktails on the menu: French 75 and thought it would make for a great change from the regular champagne. Luckily for me, whoever made it knew exactly what they were doing. It was superbly balanced. I can’t say enough good things about the selection of snacks that came with it either: Giant olives, warm cashews and almonds and wasabi peas. Amazing! The first dish that we were served was the amuse bouche. It was presented in exactly the way that you’d expect in a restaurant, “Before your meal the chef would like to offer you an amuse bouche of fresh peas and pea shoots on a pea terrine”. This dish was both texturally complex and absolutely delicious. We were offered a selection of breads which I turned down, whilst Kamara couldn’t resist a piece of pretzel bread ? One small gripe here: there is no way to fully turn off the TV. Every time that my back brushed against it, it would turn back on again. An ideal solution would be to have a padded cover to go over the screen but failing this, a permanent off button would be useful. Kamara chose to drink the Chassagne Montrachet with her starter whilst I continued with my cocktail. However, Roberto suggested that it would be good idea to pour my Château Moulin Riche 2010 to allow it to breathe before the main course was served. Kamara tried the Shorbat Adas (lentil soup) whereas I opted for Gulf Mezze. The soup was very rich and flavourful. The mezze were ok but I feel like regardless of the airline, the mezze always seem a little claggy and pasty and lack both protein and texture. One day I’ll learn to stop ordering this dish! At this stage we once again dipped into restaurant territory as we were offered a grapefruit and orange granita with jelly to cleanse our palettes. Kamara’s main course was the grilled salmon with chef’s seasonal vegetables and pink peppercorn hollandaise. The salmon was beautifully cooked, with a crunch around the edges and a moist pinkness in the centre. The vegetables were lightly cooked and retained a real vibrance of both colour and flavour. Having asked the chef for his recommendation, I was told that the Lamb Briyani was exceptional. The initial presentation didn’t really wow me, though I loved how generous the chef was with the toasted cashews. I had initially thought that I’d been presented with a large rice dish that happened to have shreds of lamb interspersed throughout it. On putting my fork through the dome of rice I found numerous giant pieces of tender lamb in the centre – a fantastic surprise. The rice was neither pasty nor crunchy, it was extremely well cooked. The crunchy onions and cashews worked very well to complement the softness of the lamb and the pillowy rice. I’m really glad that I ordered this dish. I have a feeling that a steak would have been good but I can definitely get a better steak on the ground. This was as good as any Biryani I’ve had anywhere. At this point we were both really full and conscious of the fact that we were only five hours from landing, so we decided to skip dessert and ordered fresh mint tea. The tea was brought out with a selection of Arabic sweets and extra fresh mint leaves. Overall, I was extremely impressed with this meal. The food was presented in a very elegant fashion and there were numerous restaurant like touches like the enormous napkins, amuse bouche and palate cleanser. All crockery, cutlery and stemware was full size, the service was highly pre-emptive and the food and wine was of a very high quality. I’m sad to say that having flown apartments again a couple of times since, things have definitely gone down hill with the F&B offering but on this flight I experienced on of the best meals I’ve ever had on a plane, despite the lack of obvious ‘luxury’ ingredients like caviar, lobster and foie. With only five hours to go before landing, I finally got to make the request that I had been waiting years to make: I called an FA over and asked him to prepare the shower for me. He asked me to wait five minutes whilst he got everything ready and I took the opportunity to check out the other bathroom. Quite a different setup to the gold and wood favoured by Emirates. Very sleek and modern, particularly the circular glass sink. Amenities were provided by Le Labo (though this has now been switched to Omorovicza). Red underlighting and Etihad geometry projected onto the ceiling. Disco toilet. Waiting for the shower to be prepared, I hung out at the top of the stairs. The same geometric shapes from the bathroom were projected onto the ceiling here. At this point I focused on the amber light emanating from the economy cabin downstairs and became gripped with a sense of the absurdity of my current situation. Downstairs there were almost certainly people crammed into one of the middle seats in a block of four, wedged between people of questionable personal hygiene and paying handsomely for the privilege. Meanwhile, here I was upstairs, waiting for my shower to be prepared after my fantastic dining experience paired with cocktails, vintage champagne and fine wines. Most ridiculous of all, I had paid around £230 in taxes for the experience plus a haul of miles which I had been given as a reward for flying to the US in business for next to nothing. And still, there are people who tell me that I must be crazy, how could I possibly have the free time to research all of the travel tricks that I know. Surely it can’t be worth it, can it? Researching airmiles tricks and planning trips well in advance to get the best possible deals: 100% worth it. Stepping into the shower room I couldn’t help but chuckle to myself. However you cut it, the fact that I was up above the clouds in an enormous double decker jet, about to step into a shower in a room with heated floors and a selection of extremely expensive cosmetics – was borderline absurd. One hundred years previously humankind first took to the skies en masse, flying single propeller planes in a bid to dominate the skies of Europe during WWI. It’s hard not to think about how far we’ve come since. A fresh towel had been draped over the towel rail for me and on the side was a bottle of body lotion and a note. Le Labo Bergamote is the same stuff handed out in most Park Hyatt hotels, very high end, although not particularly moisturising. Very simple shower controls. The button on the bottom left turns the water on and off. The green/ red light up gauge indicates how much of your five minutes of water you have left. Once you reach the end you can use a further ‘reserve’ minute of water. Le Labo Bergamote Shampoo, Conditioner and Shower Gel. Not the most enormous shower head but the pressure was great and the temperature controls worked perfectly. I returned from my shower to see that our turndown service had been completed in my absence. The bed featured super plush regular pillows as well as the smaller multi-coloured pillows which work great as a bolster if you’re a side sleeper like me ? Before getting into bed I took the chance to explore the vanity cabinet and fill up my amenity kit bag with the contents. My amenity kit wasn’t quite as colourful as Kamara’s but still very large and harder wearing than most branded kits that you get on planes. I quite like these amenity kits. Going the unbranded route doesn’t come across as cheap when you get something authentic and handmade like this. With only 4h30 to go until landing we went to sleep. Whilst the privacy is unparalleled and the bedding very high quality, I did find the bed way too hard (and I’ve spent a lot of time in Japan!). Three hours later I awoke to the sight of a spectacular, technicolour sunrise spanning six full windows. As far as ways to start the day go, this takes some beating. I ordered a triple shot cappuccino (I mentioned that we only had three hours of sleep right?) and it was served with a warm croissant, Danish and double chocolate chip cookie. We were both still quite full from dinner a few hours earlier so we decided to skip breakfast and just enjoy the sunrise with more tea and coffee. Soon our entire double apartment was filled with an ethereal golden glow. Bleary eyed but very happy. After our third round of teas and coffees, we got changed and assembled our belongings in preparation for landing. The cabin manager came over to thank us for flying with Etihad and to wish us a safe onward journey. From the moment we stepped on board this was a truly magical experience. I truly doubt I will ever top the wow factor of first setting foot in the First Class cabin and seeing the Apartments in the flesh. The service throughout was pro-active, pre-emptive, warm and humorous. Perfectly balanced. The food and drink was very good, despite the lack of real showstopper food items or one of the prestige cuvées with a little more name recognition such as Krug or Dom Pérignon. I would say that the fact that both the PJs and the amenity kit were unbranded was a minor negative, as was the super hard bed. The fact that you can’t store a Rimowa carry on in your apartment without causing a tripping hazard was also quite annoying. In the grand scheme of things though we’re talking about some fairly minor complaints when you’re being exceptionally well taken care of whilst flying in your own freaking apartment in the sky! Looking back at our ride, from the terminal in Abu Dhabi. Another great review…and I love the new website! I’ll be on EY F from AUH-JFK in a couple of weeks so I’ll have to make do with the Billecart 2007. The hard product should still be awesome though. One major downside of the LHR-AUH route is that it is way too short, I hope you get to really savour the experience on your 13h flight ✈️. Also, don’t forget the Billecart 2007 tastes just as good when mixed into a French 75 ??? Awesome review! Never forget when I first stepped foot in the Apartments. My only complaint about it is that the seat doesn’t recline, so you can’t really lounge and watch TV. True, a lot of people complain about the lack of recline. I’m one of those people that sits with their feet up and the slowly puts their entire back flat on the seat though. I never got stopped by a non-reclining seat but chiropractors love me ? I’ve got MLE-AUH-LHR next year and have decided to just go for J. On a sub 8 hour night flight I just can’t justify F.
On my return trip last year I awoke from my J flight to LHR feeling refreshed and not hungover. 105k AA Miles is no joke. That’s almost enough for a R/T LHR-AUH-CPT in J on EY ? I feel ya on the F vs J. On my longhaul J flights to my # 1 priority is rest. I’ll get in maybe one movie during the flight and after that I’m out cold for the majority of the flight. If I’m flying F, then I’m up on a binge with every single amenity available. For my EY flight to/from MLE, It’s basically for the experience. I told my gf she had to experience CX F and EY Apartments. We got CX F done(she now ridicules the CX and AA J seats. Spoiled! God help her if we ever have to fly Y on that route lol), now to get in the EY Apartments. Jarvis! Finally got round to looking at your new website – it’s fab!! Can’t say anything else superlative about this TR that hasn’t been said or shown in the stunning shots – except just ‘wow’! Hope to catch you next time I’m in London. PPS How do you still keep those abs with this kind of eating and drinking and flying – HUGE respect!! I’m lucky that I found a sport which I absolutely love and which keeps me in decent shape. Much like flying, if I’m away from jiu-jitsu for too long I start to develop a physical longing for it! You know if you really want good biryanis you should come to India. The biryanis here will blow your mind. And your taste buds. ? I definitely plan to visit India soon, if the biryanis are half as good as the fish biryani I had in Oman the other day – I’ll be very happy ?